The follow article was written by Jamie O’Flaherty, a reporter for The Avondhu Press, and published in that newspaper on Jan 11th 2018. The article was written on the occasion of Fr Ned’s 100th birthday. Sadly, Fr Ned died on 20th Dec 2018. We reproduce the article below which provides some details of his background and life as a priest. Photo courtesy of Avondhu Press. A little bit of history is being made in Kilworth this week when on Thursday (11th), retired Priest Fr Edmund (Ned) Motherway reached the ripe old age of 100 years. He is scheduled to celebrate the day with his family and a few close friends and priest colleagues with a thanksgiving Mass at his home. He was delighted to receive a letter from the President and a cheque to mark this special day. Fr Ned was born in the village of Ladysbridge in East Cork, the 2nd child of five to Mikey-John and Helena Motherway. The family owned a small pub and a farm in the village and Ned lived the life of a country boy of that time. Taking the milk to the creamery or local shops, spending time with his grandparents and extended family and meeting the ‘boys on the corner’ to learn all he needed to know about life! From a very early age he showed a huge interest in the spiritual life. He did well in school and even helped the younger boys to learn their catechism and Irish language. His life could have taken many paths; he was a good hurler in primary school. He was small but had long arms and was able to weave in under the other lads and get at the ball. The trainers wanted him to play for the county but he only had one goal on his mind and that was to ‘go for the Church’. He also loved singing and would often entertain family and friends. When he was 12 he made what he laughingly refers to as his ‘debut’ at the Cliff Palace in Ballycotton. It so happened that on the same night there was a talent scout from RTE in the audience. After the show, he offered ‘Eddie’ as he was known as a child, a chance to go up to Dublin and sing in a regular spot on the radio. After a little consideration, he turned the offer down saying he wanted to concentrate on his studies to become a priest. Much to his parents delight, as the thought of their little boy heading from the little village to the bright lights of Dublin was cause for great concern. He attended the CBS in Midleton as a day student for his secondary education, cycling seven miles each way on a high nellie bike he borrowed from his aunt. He then studied for his matriculation at UCC. When he was 18 he wrote to various seminaries. He had a distant cousin Mother Anna, who was head of the Blue Nuns in Malta. She advised him to go to America to a bishop she knew. His father on the other hand, wanted him to go no further than England as, in those days if you went to America, you never came back. Fr Ned said that he would send both applications away and leave it to God as to which college would accept him. It was Oscott College in Birmingham that replied first so he packed his bags, aged 18 and off he went – this, the boy who had never been as far as Dublin was brave enough to go alone. He studied in England for six years and tried to make it home at least once a year. He met many Irish lads over there and some were from Cork – Ned Cotter and Jerome O’Flynn from Fermoy and Tim Dinan from Mallow. These friendships continued way past college years, until one by one they all died. When the 2nd World War was declared, Fr Ned’s father wanted him to come home for safety but after being away from his pals and his studies for 6 months, he returned to England and remembers clearly the night Coventry was bombed. He was on fire watch duty on the roof of Oscott College and the sky glowed orange for miles around. 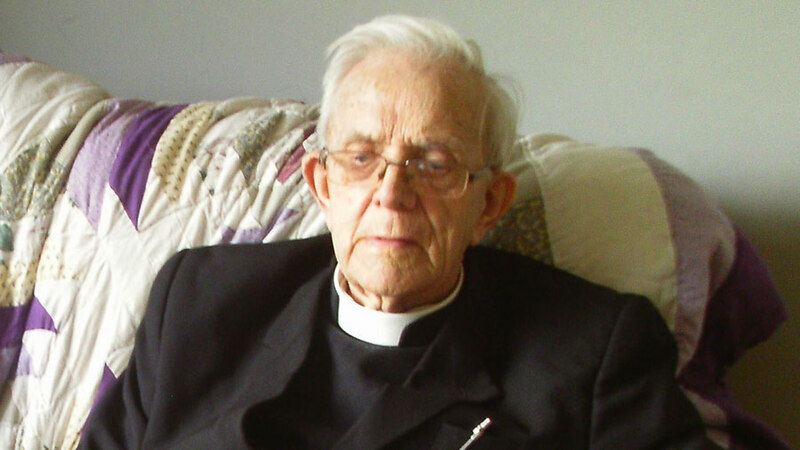 He was ordained in 1943 in Dublin, as his parents didn’t want to make the long journey ‘over’. Fr Ned never had any ambition in climbing the ladder. He never wanted to be a canon or a bishop. His life’s whole meaning was to be a priest and serve God as best he could. He was always approachable and down to earth but he was never anybody’s fool. Amongst his fellow priests, he was always considered to be wise, and they often went to him for advice. In 1991 when he was 76, he decided to retire back to Cork and found a little bungalow in Kilworth where he set up home with his housekeeper Sheila – in fact, this week, they celebrate 40 years together. When he came to the parish he made it quite clear to the PP that he wouldn’t interfere with the running of the parish in any way but if the priest needed him, he would oblige wherever he could. Consequently, he ended up covering for local priests when they went on holidays and became well known in Kilworth, Araglin, Glanworth, Castlelyons, and Coolagown where he continued to say Mass well into his 90’s, until age and ill health got the better of him. He now spends his time quietly at home and smiles as he realises the records he has broken. He is the oldest priest in the Birmingham diocese, the longest ordained priest in the Birmingham Diocese (75 years if he makes it to December). We all wish Fr Ned the very best on his birthday and thank God for giving him a long and happy life. Note (added by Cloyne Diocese website): As to the question of why Fr Ned applied to pursue his priestly studies in another country – in his case England – it should be remembered that in the 1930s and 1940s seminaries in Ireland were operating at full capacity. Dioceses had more than an adequate number of priests to meet their needs. Many men had to travel abroad to pursue a priestly vocation.